"Earl B Richardson, of Westfield, came to Old Home Week in Silver Creek in 1908, and didn't return. The little restaurant - on - wheels he had built and hauled into town was so popular, he stayed with the business." Earl B. Richardson opened up his lunch car in Silver Creek in 1912. In 1921 he started manufacturing lunch cars. In late 1923, he leased out a plant in order to build the lunch cars under cover. Two months later, the plant caught on fire and burnt down. A year and a year and a half later, Mr. Richardson died. The article in the "Grape Belt & Chautauqua Farmer", states that 26 lunch cars were built in his new factory on Hawkins St. during that year. After this, his son Raymond Richardson took control of the company. A year later, the company moved to Dayton, Ohio in an attempt to tap into a market that previously had little contact with the dining car; the midwest. Unfortunately, by 1929, the company was not in business. Newspaper articles and blurbs help a great deal in tell some of the story of these dining car companies. Especially the Richardson Dining Car Co. Previous to my research, people just thought of this company as another company that tried to follow in Ward & Dickinson's footsteps. And how wrong that is! Following Albert Closson, Earl Richardson is the reason we have Ward & Dickinson and Mulholland and the other smaller companies. These newspaper articles help to show that of all the Silver Creek lunch car companies, it was Richardson that sold, by far, the most lunch cars to local citizens. So, if you're interested in just Richardson articles, you can check out the Richardson articles page. Or, you can go back to the main dining car companies page And scroll down, on the left side, to check out all three local Silver Creek newspapers. These papers contain small blurbs, some of which refer to people purchasing Richardson built lunch cars. Also, the Ward & Dickinson page has a link to articles specific to their company. If you are just interested in the lunch cars built by the Richardson concern, just scroll down to the bottom of the page. All of these diners/lunch cars have been verified to be Richardson's by newspaper mentions. If you're interested in lunch cars built by the other companies and the unsure lunch cars, then click on that link. Byron Legters, Pen Yan, N.Y.
C. E. Hofer, Falconer, N.Y.
H. Smith, North Tonawanda, N.Y.
A. G. Wasmund, Wesleyville, Pa.
Clem J. Yonk, Bryan, Ohio. Jack Frost, Springville, N. Y.
July 1922 Yonk Dining Car in unknown location. Feb 1925 Earl Richardson in Silver Creek, NY to 5/15/26. to William Smith in late 1926. 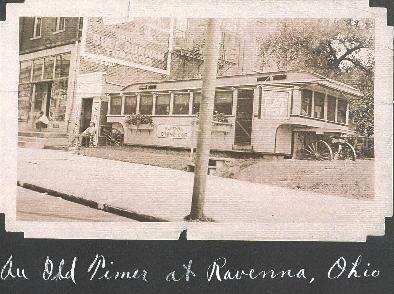 * - Sullivan's diner is listed as a Richardson in a newspaper and as a Ward & Dickinson in their ledger.